Blackbird by Anna Carey struck my fancy way back when it first came out, only given how hectic my reading schedule and life is, I never really made time for this super short book. There wasn’t really anything to make this a priority either, I mean reviews were not all OMG BEST BOOK EVER READ THIS NOW and so I just kind of let it fall onto the shelves by the wayside. I was in the mood for something different and outside the realm of what I typically read and so, I grabbed this book because it’s written in a different way than I am used to. First off, what the eff is that comparison to Code Name Verity — that book is the Beyonce of young adult books and this one, Blackbird, does not even come close to that crown. Way to jack my expectations to unrealistic heights. Second, okay so this book opens and the unnamed main character is waking up on subway tracks. A woman witnesses this and is alarmed. The conductor of the subway train stops and luckily the girl is not run over. She wakes up and comes up the track. The police start to get involved but upon seeing a note, she runs away. Eventually the main character girl comes across this boy named Ben selling drugs in the Supermarket store. He sees her and feels bad for her, so he gives her his phone number and says to call if she needs help. She calls of course, because that’s what you do when a rando gives you his number. What ensues is a thriller for sure — the unnamed girl gets some memories and realizes that these two actual adults are trying to killer and what is going on stretches beyond just two adults. I would love to just do a nice long rambling paragraph about the main character like I typically do with my reviews in this section only! 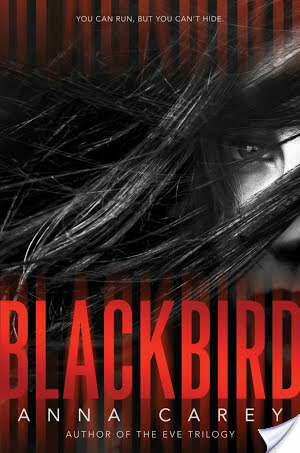 I don’t know a whole heck of a lot about the main character after spending something like 240 pages of Blackbird with her. Yo, I still do not even know her name and that is sad because it is enticing me to read book two. Also, the short length. Anyways, here’s what I know — she has amnesia but can still do basic things. She is actually kind of a badass mo fo. She also seems like the sort of person who would look like they are tweaking in real life — like Butters from South Park. Is that terrible of me to say? I think it is. Regardless, even though I did not love Blackbird I am still going to read Deadfall, the conclusion, because I just want to know the deal. So, okay, let’s say you are a teacher and are looking for something to recommend or pair with that short story The Most Dangerous Game, Blackbird by Anna Carey is a really good bet for you to take. It’s a fast read written in second person perspective — which I think might appeal to reluctant readers. Reading it makes you feel like you are literally in the story. I think that’s got appeal. I mean, I wasn’t in love with it, but I can see where other people would be and objectively I feel like I could definitely recommend this book. I mean, I whipped through it and I am curious enough to read the next book. I am not curious enough to read book 2! Unless you give it a rave review. This was pretty meh for me.